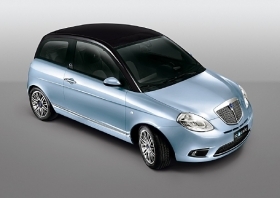 There is a chance the next Lancia Ypsilon will wear a Chrysler badge in Europe. Due in mid-2011, the new Ypsilon will be a 5-door subcompact, while the current model, introduced in 2003, is a 3-door only. TURIN – Starting as early as 2011, Fiat S.p.A. may extend the Chrysler brand name to models currently sold as Lancias in Europe. Such a move would be a blow to the 103-years-old Fiat-owned automaker that many speculated would play a greater role in Europe following its parent's decision earlier this year to take control of Chrysler. Fiat has a 20 percent stake in the U.S. automaker. “There is no doubt that, outside a limited number of markets in Europe, Chrysler is going to be the global brand,” Fiat-Chrysler CEO Sergio Marchionne told Automotive News Europe late last month. He said that using the Chrysler brand name makes sense because it is more internationally recognized than Lancia, but he stopped short of saying Lancia would disappear. “We need to be very careful that we don't destroy Lancia's roots, to find a way to preserve the identity of Lancia through an agreement that commonizes as much of the portfolio as possible (with Chrysler),” Marchionne said. One possibility is that the Lancia brand continues to be used in a limited number of European markets such as Belgium, France and especially at home in Italy. In 2008, Lancia had global sales of 103,000 cars of which 93,000 were sold in Italy. Last year in Europe, 29,000 Chrysler brand cars were sold. A second possibility would be for Lancia to become an upscale Chrysler subbrand in Europe. Fiat does something similar with Abarth, a sporty subbrand used on Fiat models such as the 500 minicar. Jaguar did this in the past with the more luxurious Daimler range. A third example comes from Ford of Europe, which uses the Ghia badge on more upscale versions of its models. But some Fiat insiders fear that turning Lancia into a subbrand would hurt sales in Italy, where they believe customers would reject a Chrysler wearing a Lancia badge. Fiat is expected to decide Lancia's fate by the end of 2010. By next year Chrysler will have launched crucial models such as a new generation of its 300C large sedan, plus heavily revised versions of its Sebring mid-sized sedan and Voyager large minivan (sold as the Town & Country in the United States). Following the arrival of those new Chryslers, Marchionne says Fiat will have a better idea just how much Chrysler and Lancia can do together. “We need to see product, we need to see positioning and based on that we can make a decision,” he said. While Marchionne is keeping an open mind about how to allow both brands to coexist successfully, he reiterated that brand rationalization remains a key part of the Fiat-Chrysler's future because it takes a huge amount of money to maintain a brand.